If your not looking for a caravan spare wheel holder and need something else just click around I'm sure you will find the caravan parts you need on this website. We are looking for a nearside front window for an Abbey GTS Vogue 420, year 2004, it is finished with bronze trim and the details off the window sticker are: V-X/B Polyplastic… E1…Roxite PMMA….43R – 001745 …..0405 Size is 850mmx450mmx780mm Any help would be appreciated Regards. Avondale Eagle year2000. FRONT LOCKER DOOR This caravan is the single axle 21ft length overall with a fixed bed. I would think that other Avondale models would use the same body and locker door. I am willing to travel to you to see what you have if any. Many Thanks. Hi we have bought an abbey stafford 540 with registration nr NYH013 and are looking for a caravan spare wheel holder and spare part to the windows. The part that holds the windows up allows you to keep it open. I live in Sweden so it is important to know the shipping costs. Thank you so much! 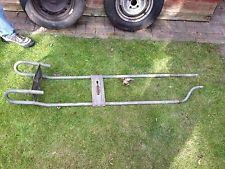 Caravan Spare Wheel Holder Page Links To All Parts Pages.